The BagBoy Chiller II cart bag features Top-Lok Technology, an innovative bag to cart attachment system that is designed to securely lock a bag to a push cart. 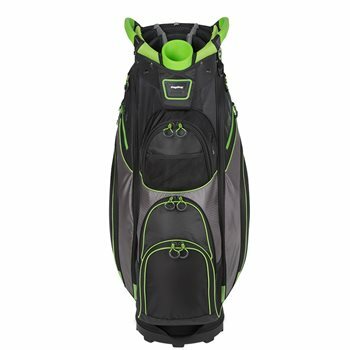 The cart bag is equipped with a 15-way organizer top and full-length individual dividers that help prevent club damage by enabling the separation of each club. The bag can be lifted with ease with ergonomic soft-grip lift assist handles, which provide comfort and prevent stress and injury. Other features of the Chiller II cart bag include a soft-grip oversized putter well for oversized grips, a removable insulated cooler bag that holds six 12-ounce cans and 9 pockets for ample storage. Featured pockets include two large side accessory pockets, an oversized ball pocket and a fleece lined valuables pocket. Review by LaRee, 3 months ago.